At a time when the political landscape in the Netherlands is changing, just a few weeks after the elections on the 12th of September we will voice our questions about what has happened to our vote since that day. What remains of the campaign promises and positions adopted by political parties after the many negotiations to form a government? Are we, as citizens, really represented in this process? Or is it time to reclaim our vote? In the current media landscape can politics do any more than move between pragmatism, marketing politics and populism – you ask, we respond – or is it time for a radical turn? And last but not least: what is the role of the arts in this? Like politics, the cultural field is also blamed for losing social support. How can the arts be an engine for ideology and change? Frascati and de Appel arts centre are inviting artists, theatre companies, politicians, designers and media pundits to respond to these questions while the government is being formed. 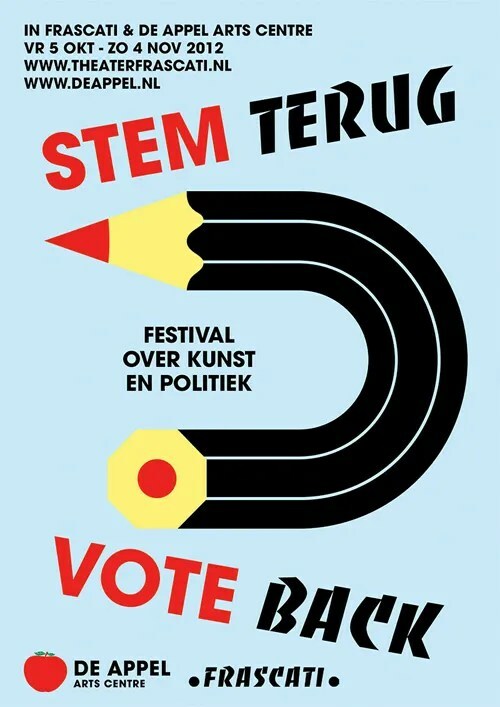 Stem terug! Vote Back! consists of performances, debates, documentaries, pamphlets, presentations, lectures, master classes and an exhibition. This Friday, September 21st at 6–9 p.m. art book shop San Serriffe opens at its new and permanent location, Sint Annenstraat 30, Amsterdam. To celebrate the opening we show the work ‘It’s Our Party’ by Otto Berchem (USA, 1967). The installation is a festive display of streamer pennants that makes use of a chromatic alphabet created by Berchem, inspired by the writings of Jorge Adoum and Vladimir Nabokov, Peter Saville’s designs for the first three New Order albums, and the condition of synesthesia. ‘Infant A’ recounts a fictitious meeting between the protagonist and Ulises Carrión, the Mexican artist and bookmaker who was based in Amsterdam during the 1970s and 80s; their conversation revolves around the poetic potential of a single letter and two books with single-letter titles in particular: Andy Warhol’s a and Louis Zukofsky’s “A.” This is the third installment of The Social Life of the Book, a quarterly subscription-based series of texts about the contemporary state of the book at all stages of its production and consumption, edited by castillo/corrales and published by its imprint Paraguay Press. With content from Hugo von Hofmannsthal, Francis Ponge, Rainer Maria Rilke, Peter Handke, Heinrich von Kleist, Robert Walser, Jean-Philippe Toussaint, Petr Král, Emily Dickinson, William Faulkner, Wallace Stevens, Alberto Caeiro, Thomas Bernhard, and Friedrich Hölderlin. Conceived, edited, and designed by Phil Baber. 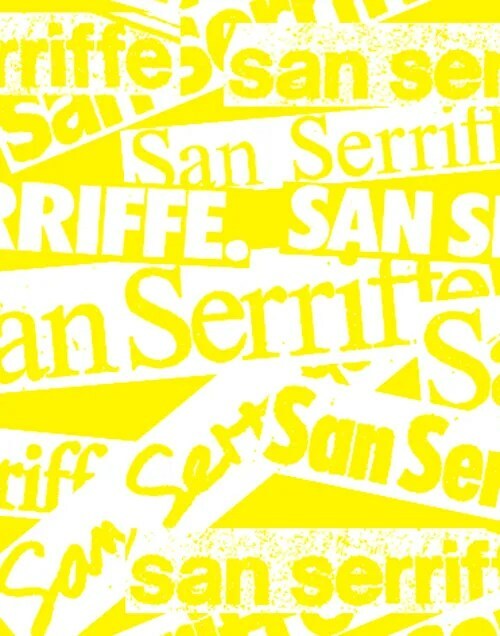 San Serriffe will be open weekly from Thursday to Saturday from 12 –7. The French term “état de veille” has many meanings. First off, it means being awake, in a waking state, as opposed to being asleep; but it also means being on stand-by, ready to start up again, like a machine set on stand-by, with a little red light glowing in the half-light of an apartment. We also talk of “travail de veille”, meaning a state of vigilance, the activity of a lookout—and this is veille as in “monitoring”, of information, health matters, and the like. In this sense, you have to be on the alert, eyes peeled, on the lookout for the slightest of signs. This state only makes sense because we know that something can happen, and we must have seen it coming. This is the state of the day-before, for veille also means eve—the state of time spent waiting, or in expectation, prior to the event, sometimes with the awareness of an imminent threat. What here gives rise to anxiety, what here calls for vigilance, is perhaps first and foremost the contemporary condition of migrants, refugees and nomads, at a moment when xenophobic policies here, there and everywhere are the name of the game. Because this is one of the main threads of the exhibition: the fate of displaced existences. The images of these bodies are handed to us in a manner akin to the documentary or photo-realism. But we must not be taken in. 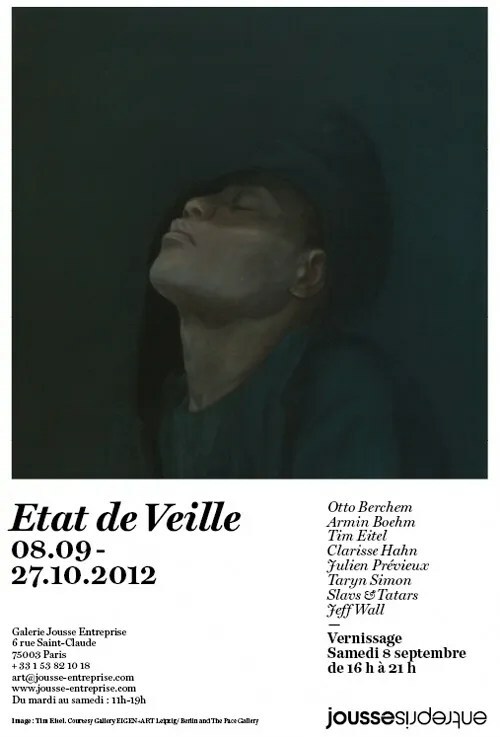 If Tim Eitel works from photographs, he gradually abandons them in such a way that the picture becomes an independent thing. Jeff Wall, for his part, starts by not taking photographs, memorizing the motif grasped by the eye to reconstruct it after the fact and methodically in front of the lens. What is displayed by these phoney snapshot images, over and above their formal beauty, is the idea of certain existential states. As it happens, those of “lives situated in border zones”. But the issue raised is also that of the conditions of groups’ possibilities. What is it that makes a group possible or impossible? Based on what systems of logic? “How are we to live together, where we are?” asks Clarisse Hahn. Needless to say, there are different sorts of groups, with specific forms, vectors and affects in each instance. Groups of guerilleros, groups of refugees. Combat groupings and exodus groupings… There are also those living-dead figures in rags who haunt the composite canvases of Armin Boehm, side by side without appearing to be able to be together. The primary group, of course, is the family—blood bonds, and kinship bonds, which means that the child has its grandmother’s eyes and its great-uncle’s chin. Taryn Simon revives the art of the photographic portrait and with it the classic device of the family album—with the sole difference that the tranquil order of genealogy is torn up here. There has been a concertina-ing of history, about which Marx wrote that, from a materialist viewpoint, it is “nothing other than the succession of different generations”, and of history this time understood in a second sense as a distressing eruption, in life’s course, of the event. Instead of the lineage or a broken line, and it is this break which must then be involved in a labour of reconstruction. There is no group or community without sign systems, without common codes with which to interact, albeit in a clandestine way, like the hobo graffiti that Otto Berchem has fun re-drawing on the walls of Istanbul. It is the common language, developed in space, which makes the group.